to barely moving because he was in so much pain. And it literally happened within a couple of days. Around Wednesday or so, we noticed there were some red bumps that looks like bites on Micah's leg, but we honestly didn't think much of it. By Thursday, Micah was starting to show he was in pain. We tried to eat supper at a restaurant, but Micah refused to sit in the highchair because he was hurting. I decided that if the "owies" got worse by the next day, I would take him in to the clinic. 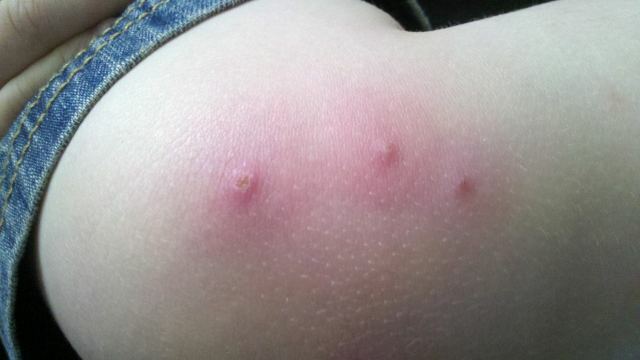 They had gone from looking like little bites to puss-filled pustules surrounded by swollen red areas. Micah would limp when he walked and whined when he was carried because he didn't want you to get near his owies. The nurse practioner we saw suspected it was some kind of infection and she took a culture from one of them, which of course had Micah screaming bloody murder. She prescribed an antibiotic and sent us on our way to await the culture results on Tuesday. Micah barely slept at all Friday night. 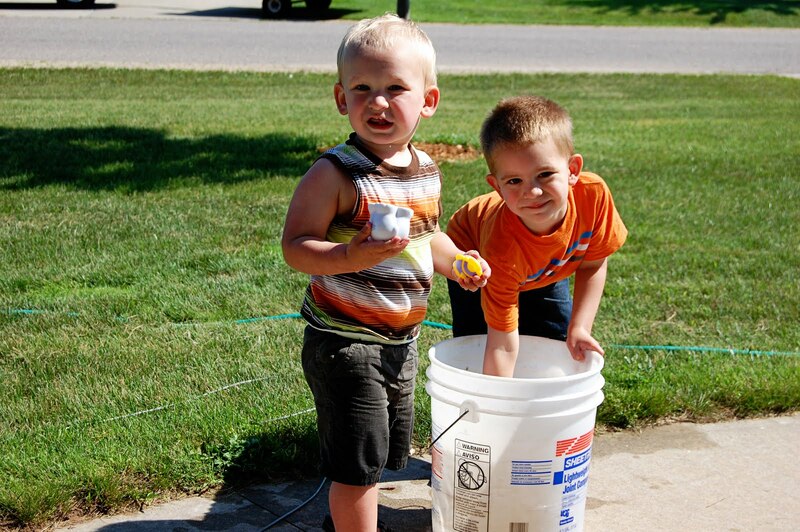 On Saturday, we were supposed to attend a little neighborhood block party, but Evan and I ended up having to switch off between playing with Isaiah at the neighbors and sitting with the sick boy in the house. 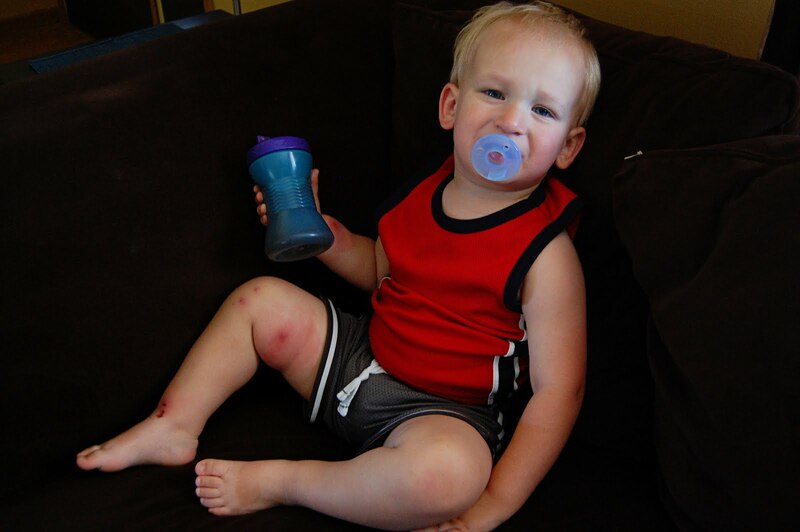 Micah woke up with a 101.4 fever and the redness, swelling, and pain had increased. A couple of his worse owies were even hard and hot to the touch. He spent the whole day sitting on the couch. He barely wanted to move, let alone eat or play. The poor boy was miserable. We put him to bed that night, just praying he would improve. I went to bed around 11:00 (after our town's fireworks), but was up with Micah around 12:00, again around 1:00, and then again at 2:00. When I went into his room at 2:00 am, I realized that Micah felt like he was on fire. I took his temperature and it read 102.6. At that point, we were off to the emergency room. I was honestly scared. We sat in the ER from 2:30 am until about 5:15 am. They were able to bring his fever down and get his pain under control. The ER doctor suspected a staph infection, so he prescribed another antibiotic along with some pain medication. Micah was an absolute angel in the ER. He sat there and just paged through his book over and over. We finally made it back home around 5:30 am and he went right to sleep. I mangaged to doze for about 45 minutes before I had to get up for work! Obviously, Micah's prospects of getting to attend our family festivities for the 4th of July were fading fast. While Isaiah and I took off for two days of family, feasting, fireworks and fun, Evan stayed home with Micah and kept him on his regime of medications and rest. He stayed pretty stationary, barely ate anything, and struggled to sleep soundly. Meanwhile, there were many people praying for that little boy. He slowly started to show initiative to get up off the couch and play a bit and even starting taking a few bites of food. Thankfully, he continued to drink plenty of fluids through this whole ordeal. On Tuesday, we got the results from the culture taken on Friday. As it turns out, Micah did indeed have a staph infection. We're continuing his antibiotics and giving him the pain meds as needed. Thank you to all of you, family, friends, and even on Facebook and Twitter, who have been praying and thinking of him. I'm really grateful!